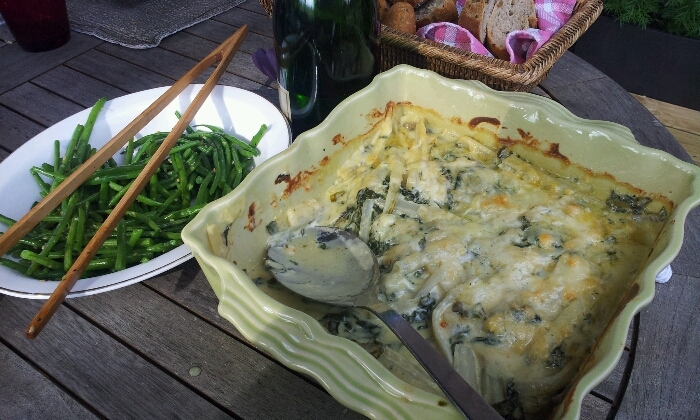 This is one of my favourite 'gratin' dishes. Remove the green leaves (put to one side) and slice the white stalks into batons (1cm x 6cm). Put them into boiling water with a few tablespoons of lemon juice or white vinegar (they can blackened if not). Cook for about 10 minutes or until tender. Drain and add the leaves with some butter to the pan just for 2 minutes and drain the liquid. You can just add cream or make a bechamel sauce with some good cheese of your liking. Mix the sauce with the leaves and stalks and put on top a little more cheese and bread crumbs and bake for 40 minutes. It goes well with fish or meat.